I’ve cleaned a LOT of bathrooms in my time that’s for sure. And if I’m being completely honest I never really minded it. I know that for some people it’s their most hated room to clean but for me it’s never been an issue. Maybe I have become immune from doing it so many times or maybe I’ve just developed a system which allows me to get in and out super fast. I will admit that I have a secret tip. It’s to play Michael Jackson’s Thriller album on full blast while cleaning. I swear it makes me clean faster…… probably. At the very least it makes me happy and that’s really the most important thing. If you have a proper system in place then you can clean any room very quickly (assuming it’s not a kids bedroom, as those places are black holes and many people have ventured into them, never to return). But for other rooms, a good plan of action will result in success. Here’s exactly how I attack bathroom. First of all, get that music blaring. The louder the better. Second make sure you have your entire cleaning kit with you. Don’t realise that you are missing something and then have to go looking for it half way through, that’s a disaster. You should know by now my golden rule. Start at the top. That means get rid of all cobwebs first starting from the back moving to the front and then from the top moving towards the ground. Make sure to be really careful with your light fixtures. They can be damaged so easily. That’s actually a reason why many companies refuse to clean them. They can also be quite expensive to replace. You can use the vacuum cleaner to get rid of all the dust and debris that has fallen on the ground from dusting all the surfaces. Next we move onto the wet cleaning part. The toilet is going to need most of your time. Spray your preferred product into the bowl but also up under the rim too. This is where a lot of smells originate from. Just because you cant see it doesn’t mean you shouldn’t clean it!! To save yourself a lot of time and effort you should leave the product to soak and work its magic before scrubbing it with a brush. Once you’re happy you’ve got everything, simply flush the toilet to finish. Use a microfiber cloth to then run over all of the surfaces including the tub and outer parts of the toilet. Of course make sure you keep changing the microfiber cloth often and never use the cloth you’ve used on the toilet to clean the taps for instance. This is why professional companies colour code all of their microfiber cloths and why you should too. 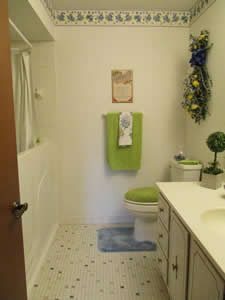 The last part of the plan is to use a microfiber flat mop, or damp microfiber cloth if your toilet is small, to run around the floor and bring it to a nice shine. Watch out for any hair or dust still caught in corner, but the vacuum should have gotten all of these already. I saw your recent article on getting tiles back to looking brand new and I thought it was fantastic. I tried tons of your tips and they worked like a dream. However now I have a real problem with my grouting. It’s stained pretty badly even though it’s only been a few years since the floor was put down. I don’t think it was sealed properly by the tiler and that may be the reason it has stained so badly. Is there anything I can do in this situation? Please help me Lorna. Thanks! This is a very common problem indeed. You see, grout by its very nature is porous and that really spells disaster for keeping it clean. Especially in a bathroom or kitchen where things spill all the time. Now grout and tiles are supposed to be sealed after they are laid, which is supposed to prevent spills turning into stains, but after a long enough period of time anything gets dirty when its being trod on all day long. If you really don’t fancy doing it yourself then of course you can always get a professional cleaning services. There’s one in Dublin called Home Concierge and they are excellent. A great piece of advice I received from a tiler friend of mine, is never to use white grout, but instead use grey grout. t still looks very nice but it doesn’t show dirt or stains over time. However in your particular situation you are in luck, because there is actually a fairly new way to get your grout looking like brand new again. The solution is called colourant for grout! There are many different types on the market and each has its own method of applying the colouring. There are pen types, brush, rollers, sponges and markers. Obviously some are easier to apply than others. If you don’t have a steady hand then the roller and sponge are not going to be very good for you. I personally like to use the marker type as it’s easy to apply and also easy to clean up should you accidentally get some on a tile by mistake! I wont go into details about all the different types as I’d be here all day, but you should follow the instructions on the back of the box very carefully. A few things to bear in mind are that your tiles may be made from an equally porous material and thus will absorb the colourant very easily. So you’ll need to be extra careful. Also afterwards to help keep the grout clean you should really seal it. Some of the more expensive colourants do include their own sealer though, which I would recommend as you are killing two birds with one stone. This is definitely a job that will take you a long time, that’s for sure. But it’s really going to be worth it. And once done it won’t have to be done again for very many years. Of course it has to be said that if products like grout colourants exist and are seemingly selling very well then maybe tiles have a fatal flaw. Maybe there needs to be new type of grout (http://www.bobvila.com/articles/cleaning-grout/) or maybe we need to move away from tiles altogether. I don’t actually have any floor tiles in my house anymore, our open plan kitchen and sitting room area has polished concrete instead. It’s easy to clean, never stains or changes colour. It looks incredible and shiny all the time and it’s unique as very few homes have it. Maybe in years to come we’ll look back and laugh at why we ever though grout was such a good idea in the first place! Just some food for thought. How Do I Clean Ceiling Fans? I know that this won’t be an issue for most of your Irish readers. But this is a big one for me as I live in the States and every room has ceiling fans. Without them you’d just melt in the summer time! But they really gather a lot of dust. I know I need to clean them more often but I’m just so busy. When I do get around to it the dust just falls off and goes everywhere. No matter how hard I try to catch it all, it just floats into every corner of the room. I don’t have any ceiling fans in my home. But that’s just because the weather here in Ireland is usually terrible and there is no need for them. But back when we had them, they were always a nightmare to clean without making a huge mess. I understand exactly where you are coming from as I and many others have had this exact same problem. However there are some solutions. First of all it should go without saying that the fans should be the very first thing that you clean so that you don’t end up having to cover the same areas twice. Like I said I used to struggle with this as well, so I contacted one of my best friends who is a professional cleaner in Florida and she told me the method they use to great effect. First of all they strip off all the bed cloths and just leave the bottom sheet. Then carefully using a lambswool duster, they brush the dust towards the sheet and it all gets caught in there. Then they go from room to room using the same sheet and the same technique. All the dust gets captured in the sheet and can be disposed of very easily. Now how smart is that! Once you’re done, simply bring it outside and shake the dust off before putting it in the washing machine. Some dust may have gotten into other areas of the rooms but that wont matter as they’ll be easily picked up by your vacuum cleaner or microfiber cloth as you whip around the room. I’ve been having a really annoying problem and I was wondering if you could help me out! I’ve tried everything I can think of and I still can’t seem to get rid of those dirty rings in my bathtub. They’re disgusting and they make me so embarrassed to let anyone use my bathroom. Please please help me get rid of them once and for all. Thanks Lorna. PS I love the blog, keep up the great work! I know exactly what you are referring too. The dreaded bathtub rings have been a thorn in the side for many women and as you are finding out, they can be very difficult to remove. But there are a great few methods you can try. However, please bear in mind that each of them will require a serious amount of elbow grease. But you don’t sound like the type of girl who is afraid of some hard work! The first piece of advice i will give you though is not use any abrasive cloths or scrapers as they will cause damage to your tub and just make the situation even worse for you. The first thing I would do is go the non-toxic route. And for that we’ll be using the two stalwarts of non-toxic cleaning; baking soda and vinegar. Use the baking soda to completely cover the ring on your tub and then spray vinegar over it. This will cause the baking soda to foam and bubble up, which will help dislodge any particles of dirt. Afterwards wipe it off with a damp cloth and then use a little bit of an oxalic acid product to get rid of any remaining spots. The natural chemical-free methods are always my favourite, both because they are safe and low cost, but I have to admit that sometimes they don’t work as well as I would have hoped. My next step if the first one didn’t work would be to use some baby shampoo and a pouf from your shower. This sounds like a bizarre combination but it works very well. It will take quite a few rounds to get the ring removed fully but that’s to be expected. If all else fails you really don’t have much of a choice but to take out the big guns; the commercial cleaning products. I don’t like them myself but every once and a while they are the only thing that will do the job. This is especially true if your bathtub rings have been there for a long time as they will be many layers thick at this stage. Use it as instructed on the side of the container, but don’t use a scouring pad. If you do, you run the very real risk of damaging your tub’s surface and that would be a disastrous outcome at this stage. 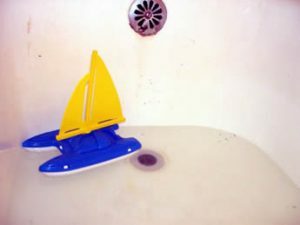 Once you’ve finally gotten your tub clean, you’ll want to make sure it never comes back, the simple solution for that is to clean it after every bath or shower or once a week you can use some rubbing alcohol or even just some diluted lemon and vinegar. A weekly wipe with either of those two will do the trick and keep your tub sparkling. I hope this helped Linda. Don’t give up just yet. Keep at it and as always please let me know how you get on.